RED Bull Racing has joined the party to celebrate the 40th anniversary of arguably one of Australia’s most recognised vehicles, the iconic Holden Sandman panel van. The team has been secretly working on a special project to create a race spec update of the Aussie classic, developing a one-off Tribute Edition Sandman, produced in house by Triple Eight Race Engineering (aka Red Bull Racing) and unveiled yesterday (Thursday, 23 October 2014), ahead of this weekend’s Gold Coast 600. In celebration of the milestone, championship leader Jamie Whincup and team mate Craig Lowndes took the covers off the project car, complete with carbon fibre surf boards, paying homage to the car’s history as Australia’s archetypal beach lifestyle vehicle. 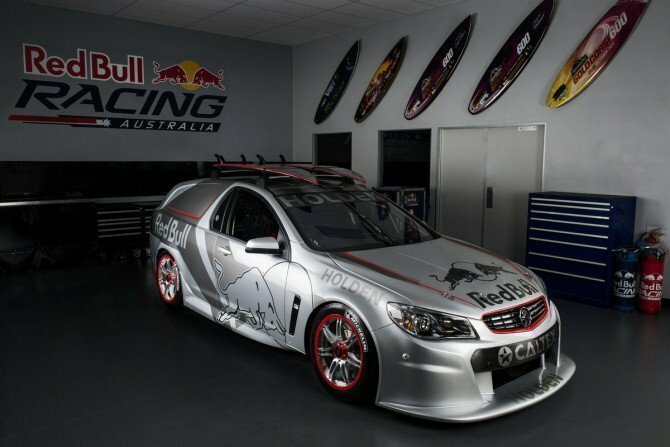 The project came to life with the design and build starting in April of 2014 in conjunction with the GM Holden Design Department and will serve as a Red Bull Racing Australia ride car, so fans will have the opportunity to tear around the track in the 705BHP piece of engineering art. The Triple Eight Project Sandman features state-of-the-art technology yet to be seen in V8 Supercars, including a six speed electro-hydraulic paddle shift gearbox and F1-inspired fly by wire throttle control. The Triple Eight: Project Sandman Tribute Edition will hit the streets of the Gold Coast each day of the Gold Coast 600.